I don't know if I've ever blogged about the importance and influence that Wishbone the dog had on my late elementary school life. 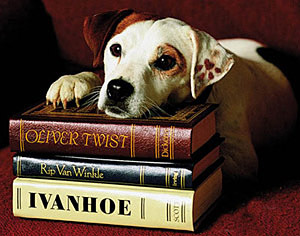 Wishbone was a PBS show, featuring a Jack Russell terrier who would fantasize about living in great works of literature. It aired from 1995 to 1998, making this show a very "I Grew Up in the Nineties" thing. Wishbone the dog is the reason that I vaguely remember the plot to The Hound of the Baskervilles or the reason that I know anything about Don Quixote--because I haven't read either book. The dog would be dressed as one of the characters in the work they were covering that episode. So Wishbone was dressed as Ivanhoe or Robin Hood or Henry Fleming from The Red Badge of Courage. That little adorable dog is the reason why I know the basics of many works of English literature without having read them. Doggie may also be the reason why I remember some of them after so many years. Who can forget a little dog dressed up as Mr. Darcy, acting opposite a human actress playing Elizabeth Bennet? Also, though the plots were obviously compressed for time, they were very faithful to the originals. I can't stand being read to or even listening to audiobooks, no matter who the narrator is. Maybe it interferes with my own processing of the story. But showing me the story, all acted out and everything, can either make me very absorbed and happy or pissed off because of the ending. I remember Wishbone and share your sentiments about him although my memory might not be as sharp as yours. Wishbone had motivated me to read some classics I might otherwise not have been inclined to read. Go Wishbone!!! I remember picking up these children's versions of classics when I was about the age that Wishbone was on--A Tale of Two Cities was one of them. Knowing the plots from the show definitely helped. Thank you for your comment!